Heart Beatz Center for Arts and Lifestyle Excellence (HBcale) announced their mega fiesta RAVE19. The event is scheduled to be held on 26th April at Khaldiya University Campus from 4 pm onwards. Official launch of event promotion and flyer launch was done by famous cine artist and director from India, Mr. Nadir Shah. Famous Indian cine artist and popular dancer Ms. Shamna Kasim, renowned choreographers Karthik Raja (Dance plus 4 – Top 10 & Indian Hip Hop Gold Medalist) and Dileep Kumar (D4 Dance Reloaded First Prize winning choreographer) along with famous musician and instrumentalist Josy Alleppey will join the evening with their fantabulous performance. The choreographers and directors of HBcale, Mr.Lalson Pereira and Mr. Anoop Manuel said that more than 100 students, from various courses offered, are performing at the event. 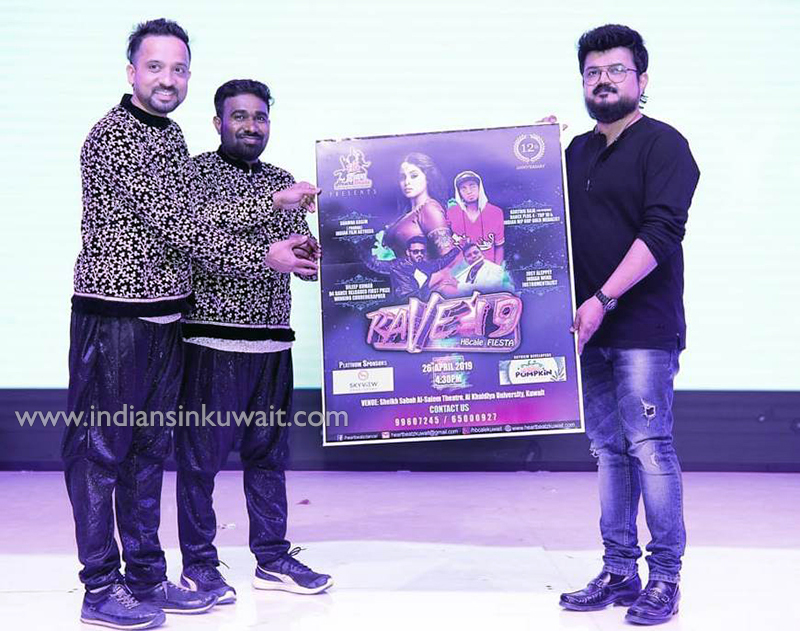 Heart Beatz was formed by three passionate dancers Lalson Pereira, Anoop Manuel and Aswathy Lalson with the goal of addressing the training of both the conventional and contemporary dance forms for the dance lovers in Kuwait. Completing 12 years of successful journey Heart Beatz is now one of the registered institute in Kuwait offering classes touching various fields for the integral development of an individual.